Rameshwar Singh was born in Rajasthan, and received his M.A. 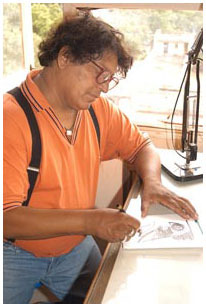 in drawing and painting from Udaipur University in 1982. He has a fascination for antiquity. The subject matter may be old-fashioned, but the treatment is novel. His work is very much keeping in tune with times. 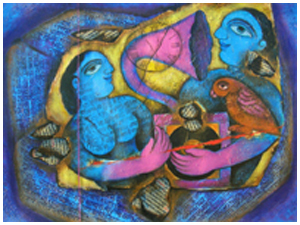 Through his paintings, he pays tribute to our cultural tradition that, he believes, can never be outdated. Blending the past with the present and striking a right balance in the process has helped him in establishing his identity. 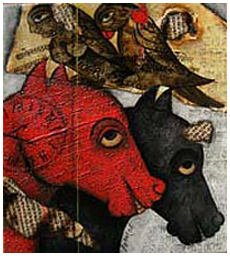 About his work, fellow painter F. N. Souza has commented "His paintings are very compact; there's a lot in them: figures, forms, and mythological content. Very colourful too. The forms are carefully constructed; there's craftsmanship in his work, and skill. 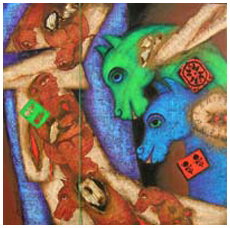 Sort of magic mantras and omens appear mysteriously in Rameshwar's paintings. His main source of inspiration is ancient scriptures, architecture and obviously his own state, Rajasthan, which is rich with art traditions. Old calligraphy, scripts and architecture also seize his mind. These frequently appear in his work. Artifacts like vessels, music instruments, games, toys and prints that speak so much of our rich tradition have a pulsating effect on him. He paints for deriving aesthetic pleasure. His work is neither a statement on anything nor it means to fight any notions or traditions. There are bodies halved into the shapes of human and animal. Strange objects fly around. An antique Roman clock invariably features somewhere. Everything seems like having been caught in a time warp. A true communication or communion is on between one colour and another, between object and subject and things and thoughts. Critic Umesh Verma has written, "Singh is a virile painter from Rajasthan. Calligraphic textures and through inner alchemic processing he creates highly decorative folkishly sweet objects and paintings. His process is more or less scientific and has obvious overtones of Rajasthan. Sweetness and mirage are the reason for the essence of his visuals. He invokes poetic-Lingo." His canvasses are textured and layered over and over. Perhaps he hates leaving any empty space on canvass and embellishes and decorates every object. He profusely uses different scriptures like Arabic, Persian, Urdu and even English. The couplets used don't make any statement. They on their own don't represent anything, but he does not use the symbols for the heck of it. To decipher them, they need to be viewed in totality, keeping in mind the objects painted. Otherwise, they are there for purely decorative purpose. A line with a shadow, cutting across the canvass, gives a sense of perspective to the painting. The concept is similar to one employed in old scrolled miniatures. Lines make a viewer stop and ponder; line-break the monotony and depth. Medium is not a barrier to him. In the paintings with a mythological theme, he depicts different forms of Lord Ganesha, Lord Krishna, Goddess Durga and the Sun God. Art critic Keshav Malik, who has reviewed his work from early days, writes, "Singh's apparitions from the cultural past cause nostalgia in viewers. This same dreamscape brims with the personae of charming figments, of birds, fish, beast and humans, of objects from both past and present. Here there are motifs from the foregoing Rajasthani painting as well as images of mundane objects of the day. All these have blended thoroughly." Malik adds, "No feel of over-crowding or of congestion. The ecology of his compositions, in other words, is just right; it suggests the interdependence of each on all, and of live and let live. This at least was the earlier Indian cultural methodology." In an interview, he told that he does not always go by set patterns. Some of his paintings extend to or beyond the frame. He started with abstract before slowly switching to figurative. May be, he has now come a full circle as he again feels like doing abstract. While concerning about declining art traditions, he feels that puppetry, folk dances, scroll painting, tattoo, etc belong to the rich art tradition. If no attention is provided to their revival, these will simply vanish.